Once again, the continent’s best cyclocrossers converge for another installment of the US Gran Prix of Cyclocross. The Deschutes Brewery Cup holds the seventh and eighth rounds – the fourth weekend of racing – in Bend, Oregon, home to Ryan Trebon. Trebon led the series until the last race in the USGP, when a pre-race injury led to a compromised performance, a 10th place finish, and a loss of the leader’s jesey. His injury was more significant than initially appeared, and he’ll sit out this weekend’s races while he recovers and trains himself back into form in time for January’s National Championships in Madison, Wisconsin. Jeremy Powers, meanwhile, has won the last three USGP races and taken over the series lead. Trebon sitting out and Geoff Kabush in a distant third, Powers could sleepwalk to the overall victory. Kabush would need to win both races, and Powers would need to crumble disastrously in order to not score the points to hold off Kabush – in all likelihood, we’re looking at a Powers victory of the USGP for the second year in a row. Can anybody beat Jeremy Powers? A trip to Koksijde a couple weeks ago means that we haven’t seen a North American form-test from him in a while, but we still think he might be a step above anybody else on the continent – at least ever since Todd Wells ended his cyclocross season. We tip Powers to go two for two this weekend, barring any mishaps. How’s Tim Johnson’s form? The past month have seen him build form that was elusive earlier in the season. He picked up 3rd place at the USGP round 5 in Louisville and went on to win races in Iowa and Los Angeles, cracking a surprisingly long drought. What of Geoff Kabush? The muttonchopped Canadian is spreading his resume around and there’s no job application like a few big wins. He hasn’t races since last month in Louisville, where he rode to strong 4th and 3rd place finishes. If he’s been training smart he may have the juice to contend for the win. Will Ben Berden wrap up his North American season in style? With Trebon’s absence, Berden might have a bit more room to fight for a podium spot in Bend. Who else will shine? The USGP draws a deep field, and there’s a lot of fireworks in the top-ten competition. With riders like Troy Wells, Tristan Schouten, Daniel Summerfield, Jamey Driscoll, and Christien Heule all riding well, there’s sure to be excellent competition throughout the ranks. We’ll be tuning in to Cyclingdirt‘s live coverage of the races to get our answers to these questions – you should too. 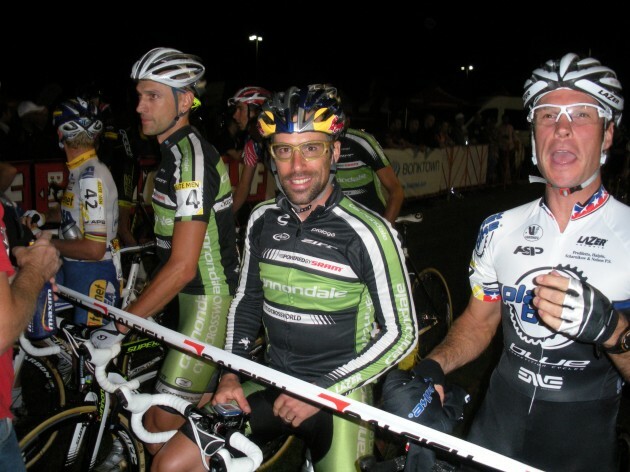 This entry was posted in Featured, Races and tagged bend, berden, Cyclocross, everyone else too, johnson, kabush, north america, powers, trebon, usgp. Bookmark the permalink.